I love to use my Tachyon devices, such as the Cocoon and the TLC bars (see here), or just draping a beautiful Tachyonised silk scarf around someone’s shoulders which helps to calm, relax and rebalance…. And also to spray them with one of the Healing Mists developed by a talented local healer here in South West England, Juliet Cotter. Each of her essences has a story behind it, and a host of testimonials. Her Miracle Mist, made with essences of gold, silver, quartz and precious essential oils, and is “Imbued with the Intention of Miracles, (to) assist you in allowing yourself to trust – have faith – and surrender to Miracle Consciousness”. 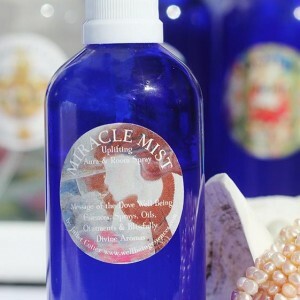 The other best-seller, Lavender and Hemp Mist, is also wonderful for calming. Lavender is famous for helping to soothe and aid sleep, and Hemp is a general miracle worker. I also love to use the Rise and Shine Mist, especially in the morning meditations, to help awaken the awareness, and it has a wonderful scent. 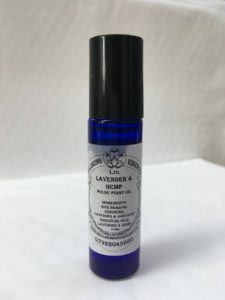 So all in all I am delighted to announce that Juliet is now producing our first two favourites, Miracle Mist and Lavender and Hemp Mist as essential oil pulse point roll-ons – pretty little blue glass bottles with a screw cap that secures a roll on top perfect for keeping in a pocket or handbag to roll on to your wrist and temples when stressed, travelling, or tired….. 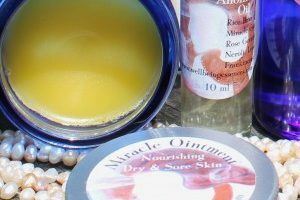 The Lavender and Hemp one I found also works to soothe the skin, such as from insect bites, and I suspect that the Miracle one is good for easing aches (although for more serious pain, the Miracle Ointment would be more powerful).